The Super Nintendo Emulator SE was a Nintendo-sponsored game development system for the Super Nintendo Entertainment System. It was designed by Intelligent Systems, and sold only to licensed Nintendo development houses. The device is in the form of a large, rectangular metal box, approximately 18 inches high, and 12 inches wide, and 13 inches deep. The box is painted grey, and bears the marking “Emulator SE” on the front in grey. The device has two controller ports at the bottom that are standard Super Nintendo Controller ports. 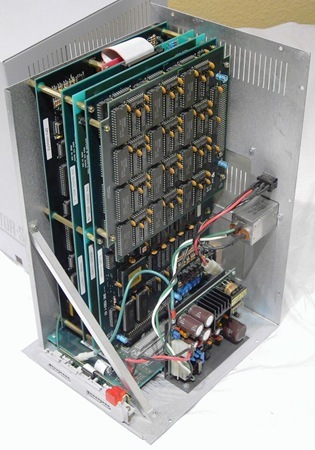 The rear of the device featured two 50-pin SCSI interface designed to connect to a PC running MS-DOS. One of these ports came with a terminator. The rear of the device also has a port labeled “Multi-Out”, which is identical to the Multi-out port on a normal Super Nintendo. Below that, it has an 8 position DIP switch. Because there is no known copy of the documentation of this machine, the function of the switches is unknown. Although it is possible the switch is used to set the SCSI ID of the device. The units bear five-digit serial numbers. The device is rated to consume 40 watts of power at 120v, and bears a 1991 copyright date. It uses a standard PC Power Cable. Another Fantastic post, I will be sure to bookmark this in my Propeller account. Have a awesome day. great! I’ve never seen one of these EVER! I didn’t think these emulators were possible.